• Stainless Steel Thimble for Hook Attachment (Hook is not included). • Come with Protective Sleeve to Prevent Overheating, Slippage, Rough or Sharp Surfaces. 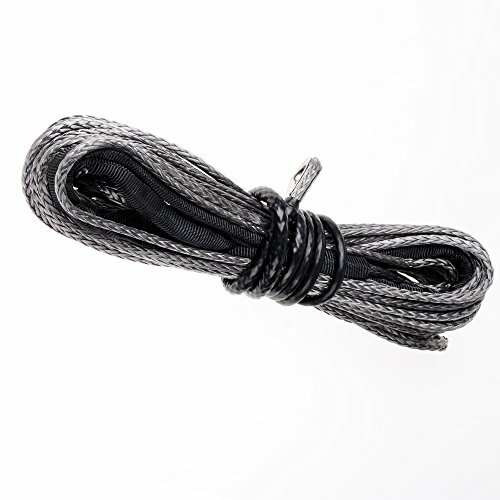 • Upgrade your Winch with stronger Synthetic Winch Rope than Traditional Steel Cables. • The Synthetic Rope won't Kink, Curl or Splinter. • Extremely Light, Float in Water. • Minimal Stretch and Non Rotation. • Easy to Handle, Splice, No Sharp Frays. • Good Resistance to UV and Chemicals. • Workable below -20 degree centigrade. • Universal fits most car SUV ATV. • Please Read All Description and Fitment Before Ordering the Product. • Please have professionals to install the items to avoid trouble which very often caused by inexperienced installer.